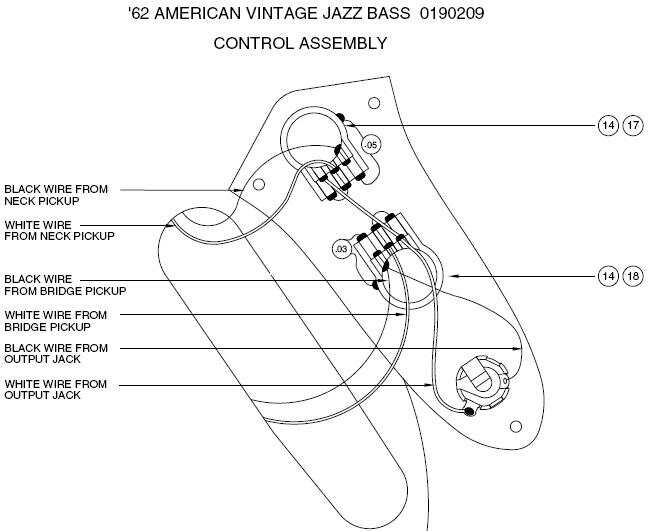 I was looking for a stacked pot for a bass at best bass gear and saw the pre-wired control plate for a 62 Jazz. It has separated vol/tone for each pickup vs the most popular with vol/vol/tone. I really like the idea of being able to control the tone separately but I haven't seen many of these around. Is there a down side to it? One disadvantage I've encountered is sometimes when you turn either the upper or lower knob, the other knob will turn with it, so you have to carefully adjust the knobs on the concentric pot so they're not too close and touching one another. "In 1960, Fender's first-generation Jazz Bass featured two stacked dual-concentric knobs, and each pickup was correctly-wired "pre-volume" to separate tone circuits. But, in 1963, Fender introduced a long-standing signal flow error by replacing the two stacked-knob "pre-volume" tone circuits with one simpler (and less costly) tone pot, improperly-wired "post-volumes". The resulting sonic flaw is unnoticeable while one or both volumes are set on maximum. However, if both volumes are set below maximum, an adverse interaction occurs: the "post-volume" tone pot now controls the cable and the amp, not the pickups! This creates a dull, muddy tone, and loss of signal strength. The CTS Dual-Tone Pot economically solves this problem by properly-controlling each pickup "pre-volume", via two separate tone circuits. Dual electrically-independent tone pots are mechanically-stacked in tandem, and operated at the same time using one common actuator shaft & knob. This allows two tone pots in the space of one. Volume adjustments now have zero adverse effect on the pre-set tones. 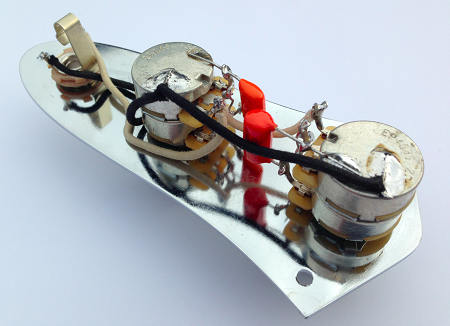 Because the Dual-Tone Pot re-uses the original Fender tone knob, the appearance is unchanged. Use a pair of .047µF tone caps to maintain the original tone pot's range... finally without any muddiness or signal loss when volumes are reduced! You may also expand the tonal range of your J-Bass by using a lower-frequency .1µF tone cap for the neck pickup, and a higher-frequency .022µF tone cap for the bridge pickup." [i]"In 1960, Fender's first-generation Jazz Bass featured two stacked dual-concentric knobs, and each pickup was correctly-wired "pre-volume" to separate tone circuits. But, in 1963, Fender introduced a long-standing signal flow error by replacing the two stacked-knob "pre-volume" tone circuits with one simpler (and less costly) tone pot, improperly-wired "post-volumes". So yeah, a good upgrade from the standard 3 knob Vol/Vol/Tone setup of today's J, but are the pots lefties? If not, your taper's not likely to act as it should with gradual sweeps. I've heard audio pots are a great option for lefties too though. Or maybe someone else offers a pre-wired 62 control plate? I have five jazz basses. 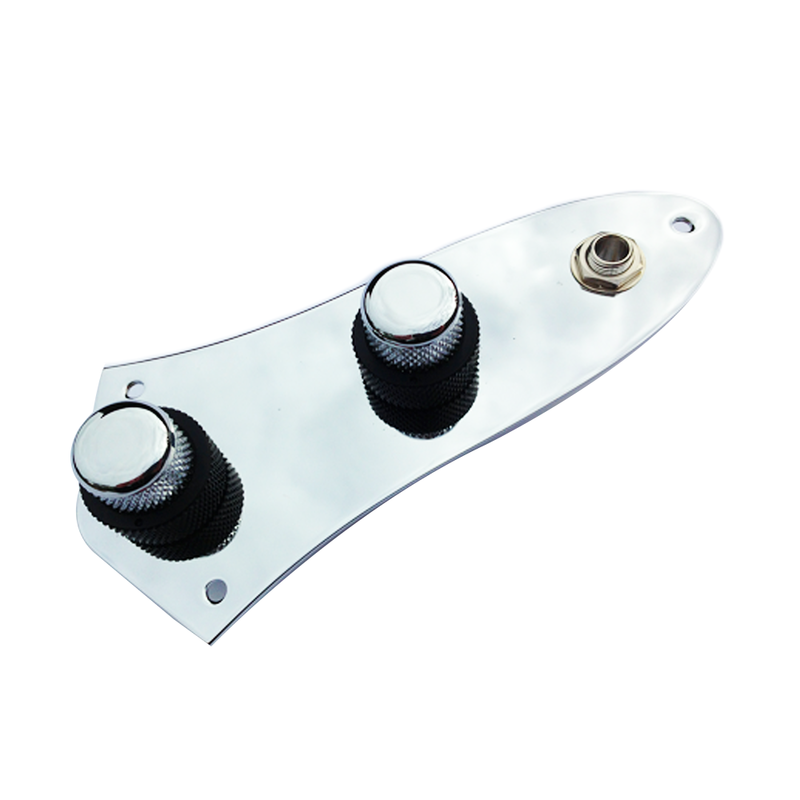 all of them are different from each other.... my 'Stack knob' Jazz bass has vintage wound pickups, and a control plate almost exactly like the one pictured above. Frankly, with both pickups on, when you turn one pickup's tone control, it just affects the overall signal going to the amplifier. Redundant in both on. I believe that is why Fender went to a single, master tone. In my opinion, the BEST, and most versatile gigging setup- is MASTER Vol.- PAN POT- Master tone. with their master- pan- and BTC treble and bass setup. It's killer. My Ocean Turquoise Stack Knob Jazz Bass. My 62 P bass reissue, and my own Edwards five from 1993. I'm going t give a try on the 62! I have some black and gold jazz control plates lying around. Let me know if you (or anyone else) want them. No charge.